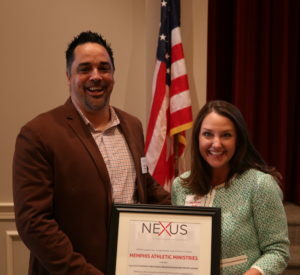 The Annual NEXUS Leadership Luncheon with the lead sports columnist for the Commercial Appeal Geoff Calkins as the keynote speaker took place on March 22. In conjunction with the luncheon the Memphis Mentoring Awards were presented to those deserving recipients. The award winners were chosen due to their leadership and dedication for mentoring in our city by the NEXUS Network. Randy Odom accepts award for MAM. Founded in 2003, NEXUS continues to cultivate and duplicate principle-centered leaders through monthly mentoring and interactive teaching sessions. Now with over 800 principle-centered leader graduates, NEXUS has created a forum that crosses religious, racial and gender lines based on the common desire to improve not only ourselves but also our city. We continue to be a vehicle for the development and improvement of personal leadership skills as well as a means for participants to build relationships in the Memphis leadership community.